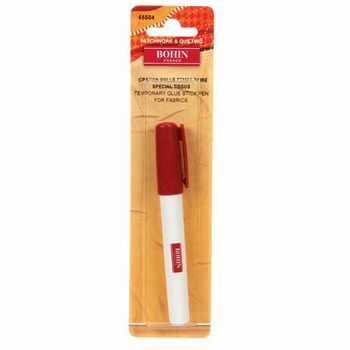 With a pen-like shape and 3/8-inch tip, this glue stick is exceptionally accurate and easy to use. Glue starts out pink and then dries clear in a few minutes. This temporary glue has been created for all kinds of fabrics – even the most delicate. The pen-style design makes application quick and easy. The glue starts out pink for excellent visibility and then dries clear in a few minutes. The drying time is sufficient to allow for repositioning and manipulating the fabric. Once the glue is dry, the fabric can be easily hand or machine sewn.